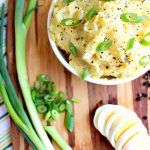 Could you use some new breakfast, lunch and dinner ideas that are easy to make? Let me show you What I Eat In A Day and how I live the better-for-you lifestyle. This post was created in partnership with Mirum. Recipes, photos and opinions are 100% my own. What I eat in a day is often pretty simple. I try to include lots of fruits and vegetables in my meals, paired with lean protein to fuel my workouts. Simplicity is key. And with that simplicity comes better-for-you products that I know and trust for myself and my family. One of the hands down necessities on my grocery list in making my simple, nutritious meals is this Brummel and Brown® Original Spread. 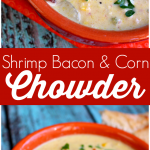 It has an amazing creamy taste and it’s incredibly versatile in the kitchen. Brummel and Brown is made with the wholesome goodness of real yogurt and a deliciously smart choice with ½ the fat and calories of butter. 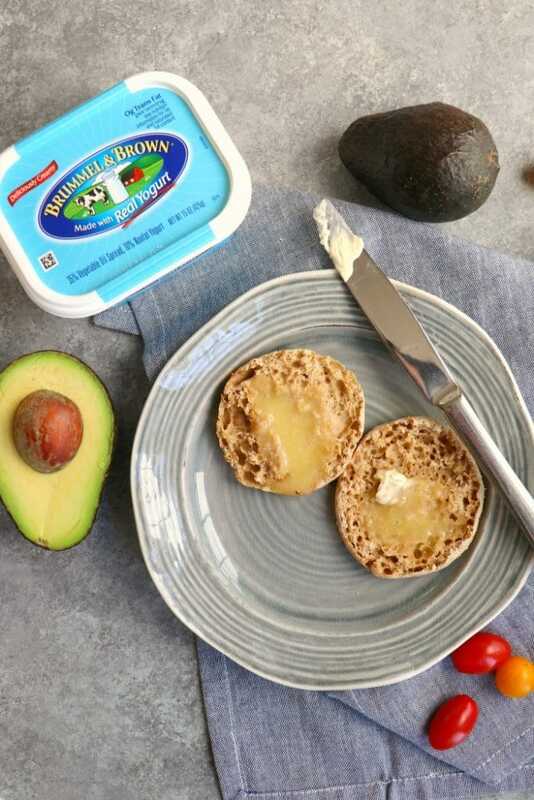 I use Brummel and Brown on my English muffins & toast, and I use it to sauté vegetables and lean protein like shrimp, chicken and fish in many of my recipes. Check out this Ibotta Offer: You can get $1 off ONE (1) Brummel and Brown Original 15 oz. Spread via the Ibotta app! Hurry before the offer runs out! 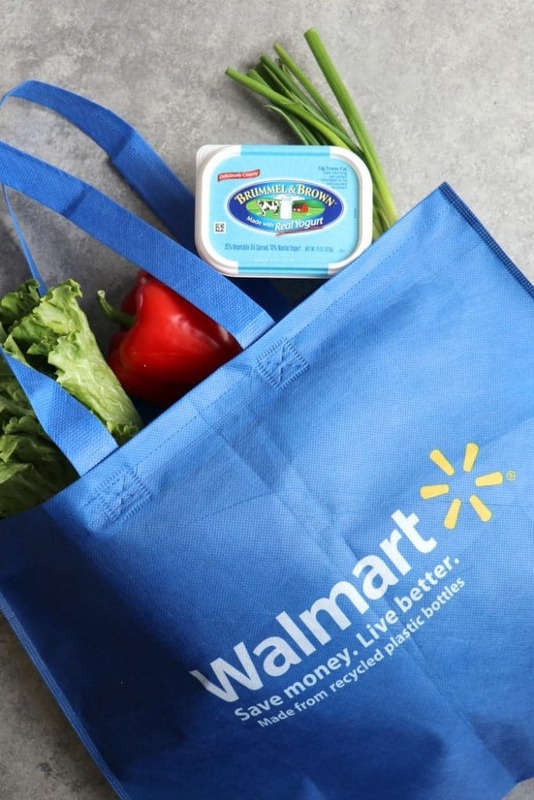 Did you know you can order your groceries on- line and get curbside pick – up at Walmart? Yes, you can. 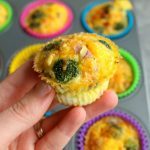 I always try to create a meal prep plan for the week, including a grocery list of all the ingredients I need to make my breakfast, lunch and dinner options. Now, I can simply place my order at Walmart.com and easily pick up my order. It’s saves me loads of time! Here’s how I incorporate Brummel and Brown into each meal of the day. After my morning workout, I always try to have a decent amount of protein, along with either fruits and/or vegetables. 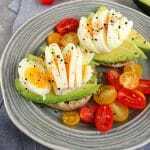 One of my favorite breakfasts is my Avocado Eggs with Tomatoes on a Light English Muffin. I like to add Brummel and Brown Spread to my toasted English muffin for added flavor. On top of the toasted English muffin, spread with Brummel and Brown, I layer on sliced avocado, and two soft-boiled eggs. 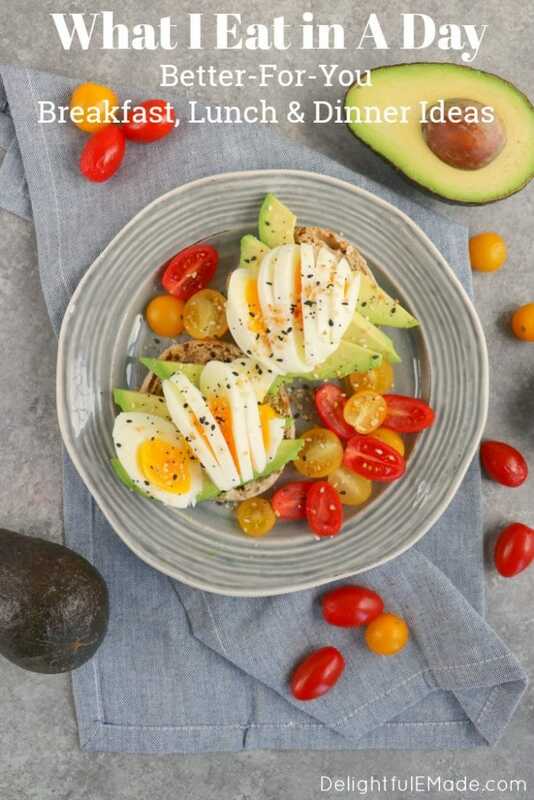 The sweet cherry tomatoes are a fantastic addition to this breakfast. I top it all with everything bagel seasoning. Directions: Begin boiling water for the eggs. Once water comes to a rapid boil, add eggs and boil for 6 minutes. Reduce heat slightly but keeping the water at a low boil. While eggs are cooking, toast English muffin. Once toasted, spread with Brummel and Brown. 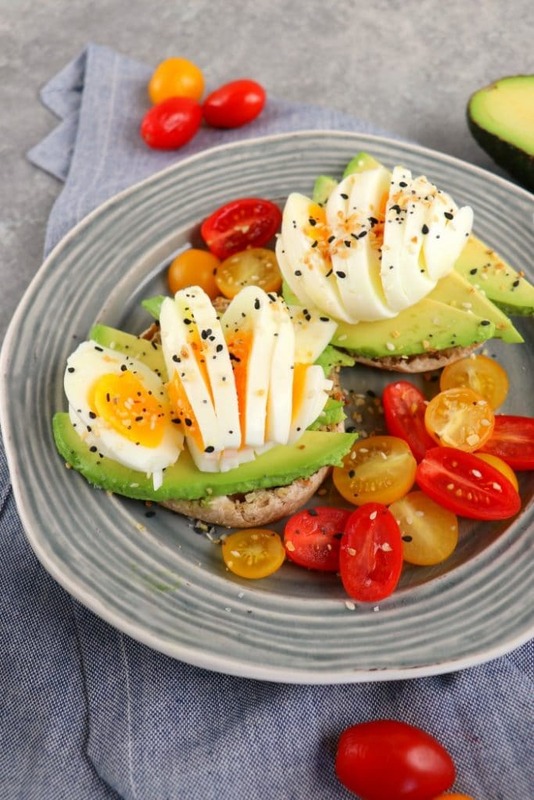 Top each half of English muffin with slices of avocado. Add sliced tomatoes. Once eggs are done cooking, remove from pan and run over cold water. Peel eggs and place on top of the avocado. Sprinkle with seasoning. Enjoy right away. As many of you know, I’m a big advocate of meal prepping. Meal prep is a great way to make better-for-you choices in advance and set yourself up for success. 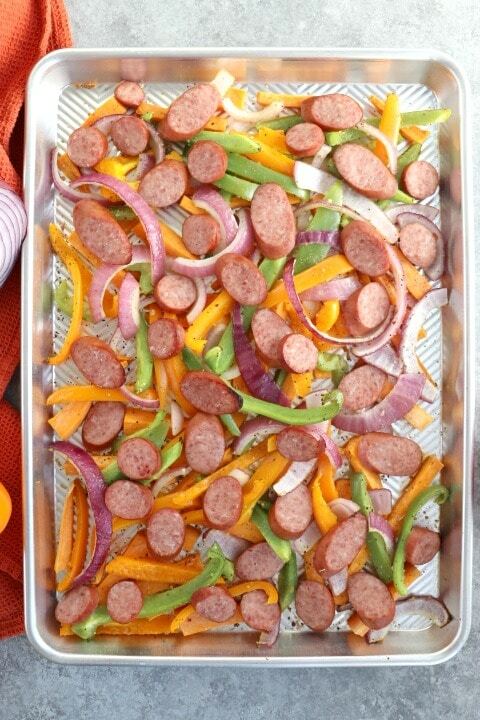 One of my favorite lunch ideas to meal prep is this recipe for Sheet Pan Sausage & Peppers. 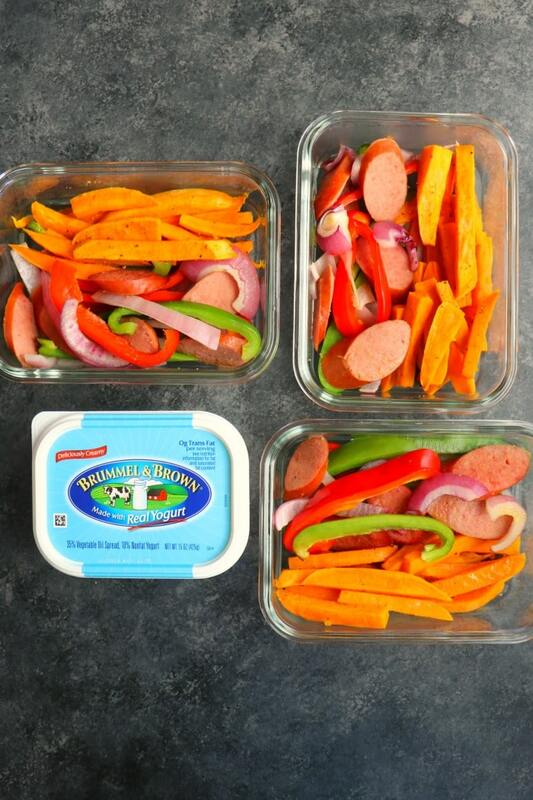 It’s a simple, delicious recipe made with bell peppers, onions, and sweet potatoes, paired with sliced turkey sausage. When prepping the vegetables and sweet potatoes I will toss these in 2 tablespoons of melted Brummel and Brown spread. 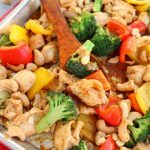 Not only does this add some great flavor, it also helps prevent the vegetables and sweet potatoes to sticking to the pan while cooking. Once baked, I will place these ingredients in meal prep containers. Because I work from home, having a better-for-me lunch option that’s already prepared is really helpful in making good food choices. It tastes amazing and keeps me full well into the afternoon. Preheat oven to 400 degrees. Peel and slice sweet potatoes into thin wedges. Place on sheet pan. Toss with 1 Tbsp. melted Brummel and Brown Spread. Sprinkle with salt and pepper. Bake for 15 minutes. While sweet potatoes are baking, slice peppers and onions and place into a bowl. Drizzle with the remaining melted Brummel and Brown and toss together to coat. Once sweet potatoes are done pre baking, add the peppers and onions on top of the sweet potatoes directly on to the sheet pan. Sprinkle with the Italian seasoning. Add the turkey sausage on top of the vegetables, keeping everything in an even layer. Bake for another 15 minutes at 400 degrees. Serve right away while warm, or place in meal prep containers and refrigerate. Like many families, weeknight dinners at our house need to be no-fuss and simple. My son often has after school actives and sports that make getting dinner on the table a challenge. 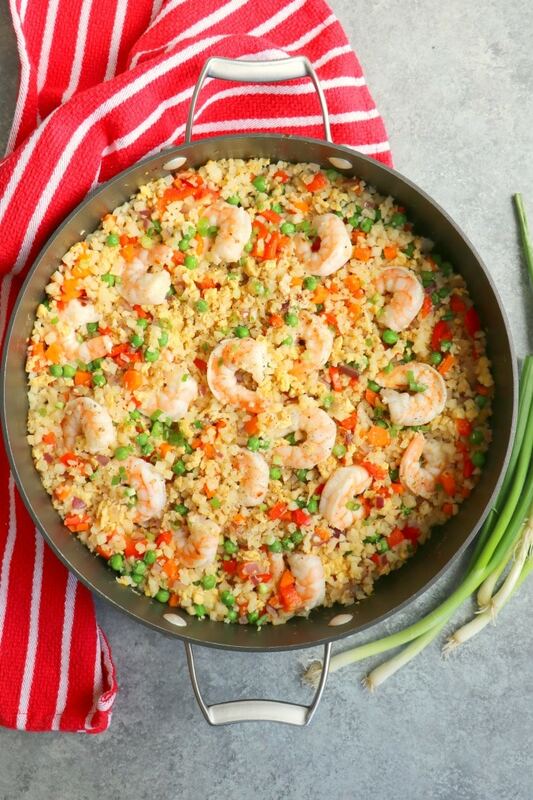 I love making this Shrimp Cauliflower Fried Rice, as it’s a great low-carb option that everyone in the family loves. 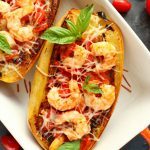 It’s loaded with vegetables, lean protein from the shrimp. Best of all, it takes less than 30 minutes from start to finish, which makes it perfect for a busy weeknight. The recipe is very simple to make. It starts with sautéing raw shrimp with garlic, red pepper flakes and Brummel and Brown. 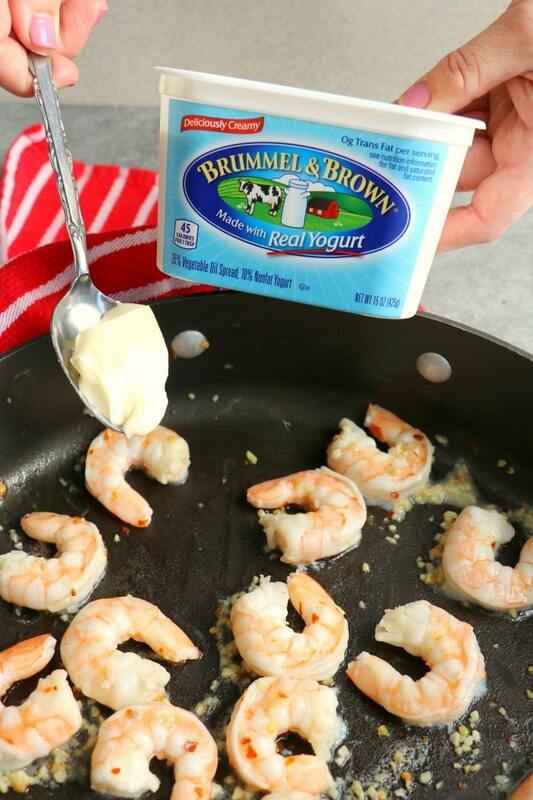 I love using Brummel and Brown, as it adds some great flavor to the shrimp and has ½ the fat and calories of butter. 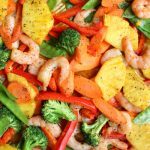 In addition to the shrimp, I also use the Brummel and Brown to sauté the vegetables in this recipe. In a large skillet, add 2 Tbsp of Brummel and Brown Spread, and melt over medium heat. Add the shrimp and garlic. Saute for approximately 5 minutes or until the shrimp become pink and cooked through. Sprinkle with the red pepper flakes. Transfer the cooked shrimp to a separate bowl to keep warm. In the same skillet add the remaining 1 Tbsp of Brummel and Brown and melt over medium heat. Add the bell pepper, onion, carrots, and peas. Saute for approximately 5 minutes. Add the riced cauliflower and continue to saute for 3- 5 more minutes. With the vegetables and cauliflower rice still cooking in the skillet, push aside slightly in the skillet. Scramble the two eggs and cook completely. Mix together with the rest of the vegetables and rice. Add back the cooked shrimp and pour on the soy sauce. Toss together to combine and heat through. Sprinkle with salt and pepper and serve. I hope these recipes inspire you to enjoy some better-for-you options throughout your day. Brummel and Brown is a hands down necessity in my kitchen, not only for it’s wonderfully creamy taste, but its versatility with all of the recipes I create for myself and my family. You can find Brummel and Brown at your local Walmart in the butter/margarine section. You can also order through the Walmart Online Grocery pickup. Those all sound like yummy options! Pinned.